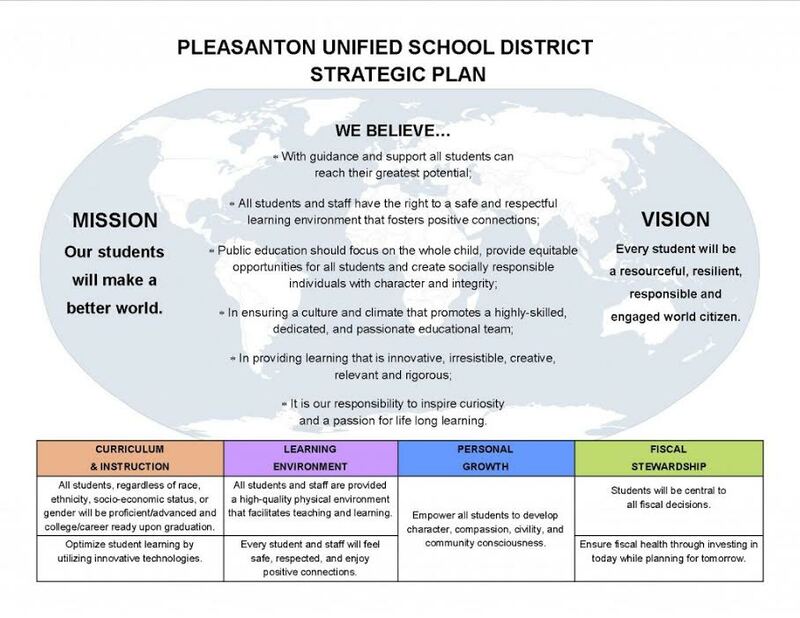 Our program aligns with the Pleasanton Unified School District’s (PUSD) strategic plan. New CCSS curricula and more CCSS resources! In California, and nearly every state across our nation, education is in transition to the Common Core State Standards (CCSS). Pleasanton Unified School District administrators, teachers, and support staff members are working hard to systemically implement the new standards in a meaningful and effective way. While there is excitement about the change, there are also challenges. The current State-adopted English Language Arts and Mathematics textbooks are not aligned with the CCSS. Until new curricula are adopted, supplemental materials will be used to bridge the current textbook materials with expectations outlined in the new standards. PUSD is working towards adopting new math curricula by the end of this school year and new English Language Arts curricula for implementation during the 2016-17 school year. Families will be informed of this selection process and have opportunities to provide feedback. Further resources can be found on the PUSD mathematics website (http://bit.ly/pusdmath). With direction from the Curriculum Department, teachers may be piloting units of study and assessments to guide selection of the most effective curricular materials. Despite differences in materials and sequence of instruction in some classrooms, PUSD maintains a fidelity to CCSS, ensuring all classrooms at a particular grade will address the same set of standards by the year’s end. Through training, collaboration, and curriculum development, it is our goal that every student will experience high-quality instruction and achieve academic success. Further information about CCSS can be found on the CA Department of Education website (www.cde.ca.gov/re/cc/). This link will take you to an external website which is not hosted by or affiliated with PUSD. If you have questions or concerns related to CCSS, please contact your child’s teacher, the school principal, or the Curriculum Department at (925) 426-4328. Thank you for your partnership and ongoing support of your child’s education. These standards have been adopted by 47 of the 50 United States. (Alaska, Texas and Florida have currently not adopted the CCSS.) Each state also had the opportunity to add up to 15% of their own state’s standards in addition to the common core. By transitioning to the Common Core State Standards over the next two years, students at Harvest Park will likely excel on the new Smarter Balanced Assessment tool, which is projected to replace the STAR test by the 2015 school year. With the Smarter Balanced testing system, students take an adaptive test with the use of a computer. As students answer questions correctly, the questions become harder. If students answer the question incorrectly, the computer generates a slightly lower level question. This process continues until an average score is determined. The state anticipates that this type of computer assisted assessment will provide faster, more immediate feedback for students, families and schools, which in turn, will allow us to more quickly address any gaps in student learning, and offer higher level supplemental information for students who are excelling in the current curriculum. Teachers at Harvest Park are working on bridging the current state standards based instruction and assessments with the new common core state standards. So if your students start talking about the Common Core State Standards, you now have a little bit of background. For more information, visit theCommon Core State Standards webpage and also Smarter Balanced Assessment Consortium. We’re thrilled to have the opportunity to help your students reach their full potential this year while fully implementing Common Core State Standards. This summer our staff spent time thinking through the question: As our students work their way ever closer toward middle school completion and onward to high school, what knowledge and skills will they need to be ready for the next step in their lives? California’s adoption of the Common Core State Standards inspired this inquiry because these updated learning goals are guiding schools toward preparing all students to be ready to move on to college or into a satisfying career when they graduate. The answer we came to, after many discussions involving teachers, support staff, administrators, and families, is that Common Core is inviting us to rethink the way we teach, and that’s a good thing. We live in a constantly changing world, saturated with information and new ideas. Today’s students are on an information journey – and they need the kinds of experiences that let them “get their hands on the wheel.” Just as new drivers can only learn so much from the passenger seat, students grappling with ideas in literature, math, science, history, and other subjects need direct experience and plenty of time to practice making use of concepts. That kind of learning, like learning to drive in a parking lot, involves opportunities to experiment and make mistakes in the safety of the classroom, with supportive and experienced teachers by their side, setting new challenges as students are ready. That’s what learning at Harvest Park is going to look like this year – students working with ideas in more involved ways – finding, accessing, evaluating, and creating knowledge. Our students are familiar with this kind of relevant, applied teaching, and in the past we have seen them thrive when they’ve had a chance to drive their own learning. We are excited to do this kind of teaching more often, especially in English language arts and math courses. The signs of students getting their hands on the wheel of learning might be with math problems that involve more than one way to get to the answer, or ask students to explain the mental map they used to arrive. Or, you might notice that when students are reading a novel, they might also read non- fiction text that explains the historical period of the setting. These are just two examples of how students will be asked to think more deeply and make connections between academic content and the world beyond the school walls. You, like our teachers, are students’ “driving instructors,” too. You have a critical role to play in providing our students with opportunities to learn and explore, giving them feedback on what’s working and what’s not, and encouraging their persistence both when they succeed and when they make mistakes. Making sure that our young people can handle their role in the “driver’s seat” of learning is a team effort – and we need you in this process. We look forward to another year of working together to build a bright future for Harvest Park students – and for all in our community. Have questions about Pleasanton’s plan for transitioning to Common Core standards and testing? Go to this website for information on the pathways, placement and other FAQ’s. Please take a moment to review PUSD’s math resources for parents. This will provide you with information on our implementation of Math Common Core State Standards. I encourage you to bookmark and review this website whenever you may have questions. The website includes: parent roadmaps, math pathways from 5th grade to 12th grade, placement processes, curriculum, resources and more.